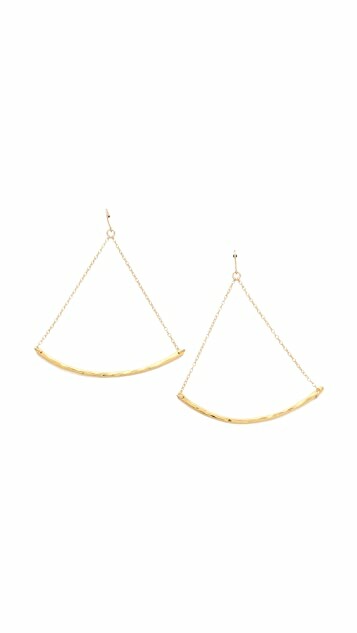 These 18k gold-plated Gorjana earrings feature a hammered bar at the chain detail. French hook. Love these. My mom loved them so much and borrowed them so often, I bought her a pair too. 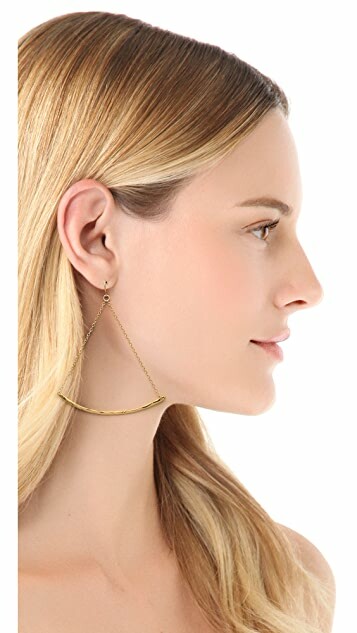 Great delicate earrings for those outfits that need a little extra somethin' somethin'. HIGHLY recommend. Although it's a bit big on me, they're interesting and nice, so i decided to keep at last. They would be better to go with simple and elegant outfit, i guess. If the gold weren't so delicate these would be massive. They are bigger than I expected, but are an 'outfit' in and of themselves. Very sassy. LOVE these earrings and i wear them almost every day. They look great alone or with the matching Taner bar necklace i purchased. I always get asked were i got them. I get a ton of compliments when I wear these. They are very delicate and petite but have a great shape and swing. The only problem is that sometimes they can swing high if you shake your head and get caught in your hair. Otherwise, these are gorgeous. These were larger than I expected, but I kept them anyway. I'm not sure they flatter my smaller features. Looked okay with my hair down and they are very lightweight. I wanted to wear them with my hair pulled back but it just doesn't look right. I like that they are unusual but would have loved them slightly smaller. These were too long and wide. Did not find them flattering. Unfortunately, they had to go back.